The medium of photography, which presents appearances and commands authority, creates a sense of self-entrapment in practice. This has led to debates amongst practitioners and critics since photography’s invention. As the equipment technology evolves, interpretations and appreciation towards photography have also become more complex and specific. Numerous theorists have put forth the idea that photographic images have a special authority in terms of objectivity and transparency. In the past, photography was valued for its documentary authority as proof of an event, which made it useful in ethnography and forensic science. In this way, photography serves as proof of history and research. On the other hand, appearance is often understood as an absolute in every photograph. Documentary authority and the accuracy of appearances are two ideas that continue to inform the discourses of photography today. The statement above is a clear description of how photography has been used as a personal medium in Bandung. Much like other cultural practices, photography does not exist in vaccum. The medium relates itself within the realms of geography, geopolitics, formal/informal institutions, and social system, amongst others. During the colonial era, the camera was only accessible to the bourgeois, which included the Europeans, aristocrats and rich merchants. The Dutch also set up a training centre for art teachers in Bandung, the predecessor of the present-day Faculty of Art & Design, Institut Teknologi Bandung (ITB). The bourgeois and ITB provided the backdrop in which photography has been used as a personal medium over the last four decades in Bandung. The desire to use photography as a means of accurate description emerged early on in Bandung. The importance of technical accuracy has been heavily emphasised by Perhimpunan Amatir Foto (PAF), the oldest existing photo club in Indonesia. Over time, the convention of technical accuracy has become the convention of photo clubs across the country. Meanwhile, the term “seni foto” (art of photography) also gained traction, allowing photographers to indirectly address the issue of aesthetics relating to art. ITB played an important role in elevating the medium as a modern art form by responding to it seriously. Mochtar Apin, A.D. Pirous and Haryadi Suadi were artist-lecturers who were quite familiar with photography. They started using photography as a personal mnemonic tool. Subsequently, Apin used photographs as reference for his paintings. A.D. Pirous also used photography in a similar way. He acquired an intimate understanding of photography during his studies at Rochester Institute of Technology, New York (1969-1972). At the time, he learnt about darkroom techniques at Kodak Center. This experience prompted him to introduce photography to ITB students. Back in Indonesia, he recruited Prof. Soelarko, a senior at PAF, as lecturer on basic photography from the mid to late 70s. This led to a new perspective of photography within the Bandung art community. “Seeing things differently” led to “new ways” of working, which diverged from the convention of photography as accurate duplication. It eventually led to the formation of Forum Fotografi Bandung (FFB) in 1986, with their first exhibition held in the same year. Chaired by Jirman D. Martha, who was educated as an architect and trained as a photographer in London, FFB had 25 members initially. Its members came from various backgrounds and pursued different ways of expression vis-à-vis photography. Apart from Jirman, the likes of Sjuaibun Iljas, Hari Pochang, Andar Manik, Ray Bachtiar and Marintan Sirait helped to cultivate a sense of diversity within the forum. 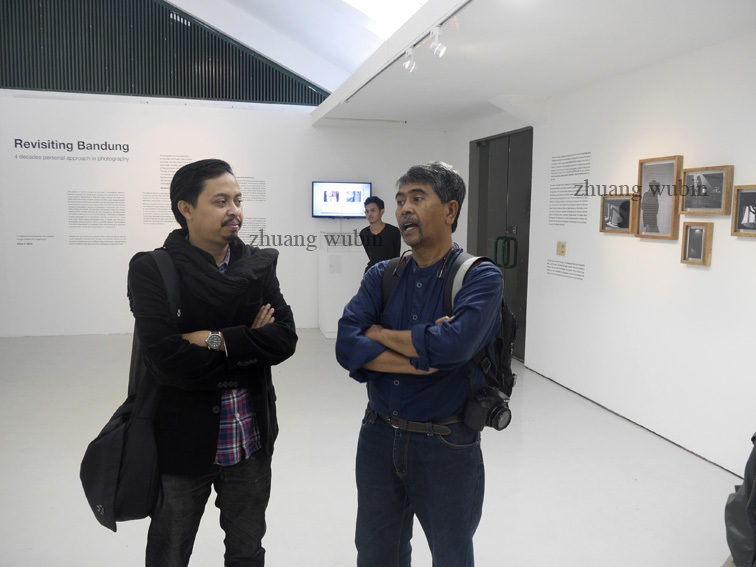 Despite criticism from PAF, FFB persisted and held its second exhibition in 1988, with the inclusion of new members Tiarma Sirait and Krisna Satmoko. In general, the photographic practices of the 1970s and the 1980s, initiated by A.D. Pirous, Sjuaibun Iljas and Krisna Satmoko, display two tendencies. First, they used photography to record personal memories in relation to specific places and time. Secondly, they used it as a medium for visual art experiments. Pirous’ photos of his hometown, Iljas’s panoramic images and Satmoko’s slides of his travels are different means in which photography is being used to record personal memories. On the other hand, Pirous’ sketchbook of photo collages, Iljas’ relief prints and Satmoko’s solarisation images clearly belong to the second tendency. Both tendencies helped to move photography away from accurate duplication to documentary authority, which constitutes appearances as ways of “seeing things differently”. From the 90s to the early 2000s, the boom in fashion and advertising photography in Jakarta drowned out those who used photography in a personal way. That was the golden era of commercial photography, which benefited many photographers, including those from Bandung. However, there are individuals who persisted in creating personal work in photography. Adhya Ranadireksa, who studied photography in Italy, is one notable example. His still life photographs often feature daily objects pictured in a controversial manner. Discussion of politics surrounds Adhya’s social and family life, informing his photographic practice. With advanced technical expertise, he creates satires of the sociopolitical life in Indonesia during the early stages of Reformasi. Deden Hendan Durahman, a graduate printmaker from ITB who continued his study in Germany, employs a different approach. He includes or erases objects in his photographic images through digital manipulation. In the series After The War (2010), Durahman combines archival photos of the aftermath of WWII with images of human beings and advertisements from the same place but from a different era. The interventions of these two artists transform appearances beyond their current state with the intention of creating new meanings. This process of reconstruction reflects a response towards post-modern and contemporary thoughts, departing from heroic ideologies in order to convey something more layered, reflective and analytical. 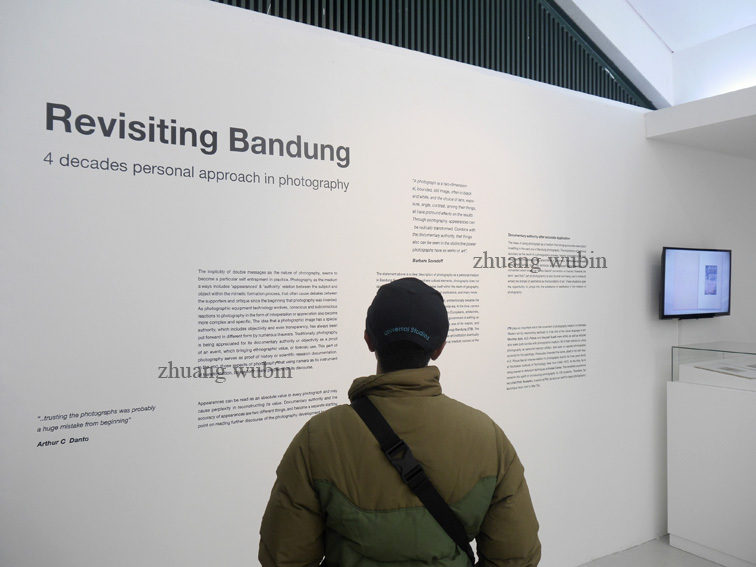 The breaking of boundaries in the photographic practices of Bandung occurred through the opening up of the personal domain by individual photographers. This development has not come out of nowhere. In modern society, people are familiar with family albums, which strive to preserve distinct moments of their lives. Afterimage (2000-10), a ten-year project by Henrycus Napitsunargo that has been exhibited at the intimate space of Ruang Depan Gallery-S14, is an example of how the photographer’s domestic environment becomes the small universe to build his personal narrative. The images are presented randomly to eliminate the aspect of time and the explicit meaning in the appearance of the objects. This approach of directing documentary authority towards the personal domain, fused with a sense of aesthetics, was quite noticeable in Bandung during the early 2000s. The Orchestra (2011) by Sari Asih utilises the panoramic format and strong colours as means of personal expression. Guadalcanal Report (2009-2011) by Gyaista Sampurno, which takes the form of a photobook, reveals a different way of evoking and displaying memories through photography. Ari Syahrazad, a graphic novel illustrator who is relatively new to photography, also employs a similar approach. His seniors Adhya Ranadireksa and Henrycus Napitsunargo introduced him to photography in 2006. What is unique about Ari is his deliberate attempt to let go of the visual illustration approach that he is familiar in his work. His photographs often look rough, spontaneous and dark, revealing his personal character. He became the first applicant from Bandung to be accepted for the international workshop at Angkor Photo Festival, Cambodia, in 2008. It was a great achievement, given that he was very new to photography then. Syahrazad then passed on his experiences at Angkor to his juniors and that helped Sandi Jaya Saputra, Meicy Sitorus, Arif Setiawan and Tandia B. Permadi enter the Angkor workshops. Tandia B. Permadi is the last to pick up photography within this group of practitioners. Starting out in 2009, his dedication and productive nature, together with the help of prominent mentors like Zhuang Wubin and Magnum photographers Antoine D’Agata and Jacob Aue Sobol pushed his work to maturity. His Self Portrait (2011) series breaks yet another boundary in terms of addressing the personal through photography. On the receiving end of psychological pressure since childhood, Permadi uses a strong sense of narration in his representation of the self. He places himself in front of the camera, playing both the roles of object and subject in his personal narrative. For an extended period after FFB had become dormant, there were few communities/collectives that encouraged the use of photography as a personal medium in Bandung. In 2005, a group called KOMVNI was established, based on the desire to accommodate the diversity of individual and personal approaches towards photography. Initially, the platform attracted lots of interested individuals. Nowadays, its main members remain: Adhya Ranadireksa, Deden Hendan Durahman, Henrycus Napitsunargo and Sari Asih. At the same time, in terms of photo publication and highlighting photography from Asia, Blackmanray Project has been somewhat successful. Founded in 2011 by three photographers Eric Setiawan, Budi Sukmana and Dicky Juwono, who have been actively fostering communication on the Internet, they started showcasing the work of photographers from various Asian countries. That became the catalyst, which brought Deden Hendan Durahman, Henrycus Napitsunargo and Sari Asih to Singapore to exhibit their works. 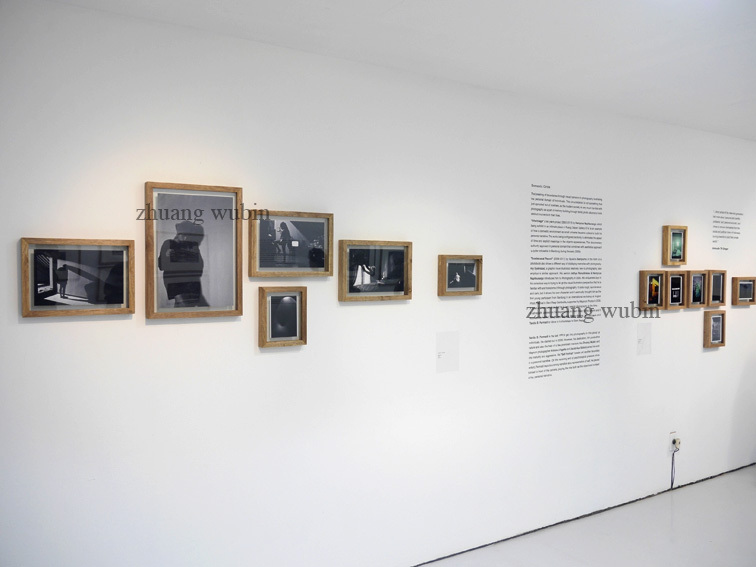 Curated by Zhuang Wubin, A Certain Grace: Photography From Bandung (2012) highlights the diversity of photographic practices in Bandung, which cannot be categorised reductively. The phenomenon sparked the idea to form Bungkus! Bandung Photography Now, a public initiative-zine that hosts a recurring open call for publication according to specific themes. The aim is to map, publish and expand the photographic practices that privilege the content, context and concept of each individual.